When I started cutting this Agate cabochon, I didn't think it would turn out looking this good! Most of it is decidedly purple, with an almost clear area on top that looks like foam! Picture an iced glass of Grapico with an attitude... Seriously, this Agate may have been heat treated or otherwise colored somehow; I can't tell for sure. But it sure looks good! 37mm x 26mm x 4.5mm. Weight: 34.15 carats. Do you like Purple Agates? 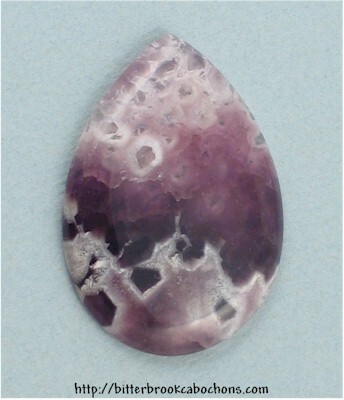 Click here to see all of the Purple Agates on the site! You are visitor number 32 to this page this year.